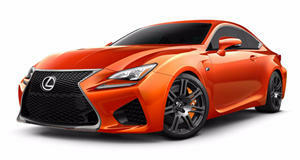 The racing variant of Lexus's muscle car will be unveiled in Geneva next week. Lexus wants everyone to know that it's committed to motorsport with the reveal of this black beauty: the Lexus RC F GT3, which comes packing a 5.4-liter V8 with over 500 horsepower on tap, mated to a six-speed sequential racing transmission. The all-new car has been homologated for racing by the FIA and will take part in tournaments in the USA, Japan and across Europe. To keep the racer as light as possible, just 1,300 kg to be precise (or almost 500 kg lighter than the production RC F), Lexus splashed carbon fiber everywhere. The hood, bumpers, rear spoiler, roof, door panels, engine air-box and dash are all made of carbon-fiber. And with its slammed, Liberty Walk style stance, massive grille and oversized rear wing, all wrapped up in murdered-out body work, the RCF GT3 looks ready to make its mark on the racing scene this year. In the US, the 3GT Racing team will run two of these in the GTD class of the IMSA WeatherTech SportsCar Championship Series. Two more will contest the GT300 class of the Super GT Series with the LM corsa team in Japan. And in Europe, Farnbacher Racing and Emil Frey Racing will compete at select GT3 racing events, having worked with the prototype vehicle last year in the VLN Endurance series.